PROJECTS - kittel-labs jimdo page! We study molecular mechanisms of synaptic plasticity and sensory physiology by combining neurogenetics, electrophysiology, super-resolution microscopy and optogenetics. 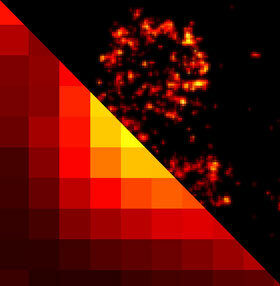 Functional nanoscopy of the synaptic active zone. Synapses are specialised intercellular contact sites, which serve as the communication link between neurons and their partner cells. At chemical synapses, calcium-ion influx triggers the fusion of transmitter-laden vesicles with the presynaptic membrane at a specific sub-cellular region termed the active zone. Transmitter substances released by this process then diffuse across the synaptic cleft and are sensed by postsynaptic receptors to convey signal transduction. A hallmark of synaptic transmission is its plasticity, which enables synapses to regulate complex brain processes by filtering, modifying, or integrating information. The details of active zone physiology and how its modulation contributes to synaptic plasticity are, however, far from understood. By combining genetics with high resolution opto- and electrophysiological methods in Drosophila melanogaster (Ehmann et al., 2014), our research tests the hypothesis that active zone physiology is modified by activity-induced plasticity in the behaving animal (Ehmann et al., 2017). To this end, molecular dynamics are followed at single synapse resolution and neurotransmission is both evoked and measured in an intact, alive, and genetically most amenable organism. Postsynaptic glutamate receptor dynamics. Hebbian plasticity describes an activity-dependent change in synaptic strength that is input-specific and depends on correlated pre- and postsynaptic activity. Thus, Hebbian plasticity represents a powerful synaptic learning rule that provides an attractive subcellular mechanism for models of higher brain functions. By engaging Channelrhodopsin-2 to evoke activity at the Drosophila neuromuscular junction in vivo, we found that paired pre- and postsynaptic stimulation increases postsynaptic sensitivity by promoting synapse-specific recruitment of GluR-IIA-type glutamate receptor subunits into postsynaptic receptor fields. Conversely, GluR-IIA is rapidly removed from synapses whose activity fails to evoke substantial postsynaptic depolarization (Ljaschenko et al., 2013). Motivated by these observations, we have teamed up with Markus Sauer and Georg Nagel to combine super-resolution microscopy with optogenetics. Supported by the Collaborative Research Centre/DFG-Transregio 166 (ReceptorLight), we are testing the hypothesis that Hebbian plasticity guides synaptic maturation, whereas sparse transmitter release controls the stabilization of the molecular composition of individual synapses. Physiological role of aGPCRs. Adhesion-type G protein-coupled receptors (aGPCRs) form a large class of seven- transmembrane spanning (7TM) receptors involved in a number of critical developmental, immunological and neuronal processes (aGPCR consortium; Figure from Scholz et al., 2016). However, despite these wide-spread functions, aGPCRs are by far the most poorly understood 7TM receptor class. Neither have the general biological and pharmacological properties of aGPCRs been clarified, nor have they been utilized yet in biomedicine. 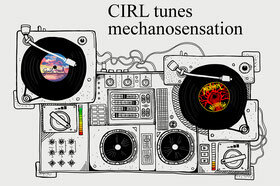 In collaboration with Tobias Langenhan, and supported by a DFG-Research Group (FOR 2149), we recently discovered that Latrophilin/CIRL, a prototype member of this receptor class, shapes mechanosensation in Drosophila (Scholz et al., 2015; Scholz et al., 2017). Currently, we are interrogating the function of CIRL in nociceptors. This project tests the evolutionary conservation of basic mechanisms as well as the receptor's therapeutic potential.